Friday September 7th: The latest in a long line of award-winning Irish comedians to appear on the Guiriness Comedy bill, Danny O’Brien kicks off the new season in September. With clever quips and kenetic delivery, the internationally successful comedian has charmed audiences around the world from Dublin to Melbourne, while sharing the stage with comedy greats such as Bill Burr. He brings his latest show ‘Lock-in’ to Barcelona and Sitges, fresh from the Edinburgh Fringe. -There are a limited number of earlybird tickets online (10€). You can also add yourself to the Facebook event list (10€). Otherwise it’s pay-at-door (12€). P.S. 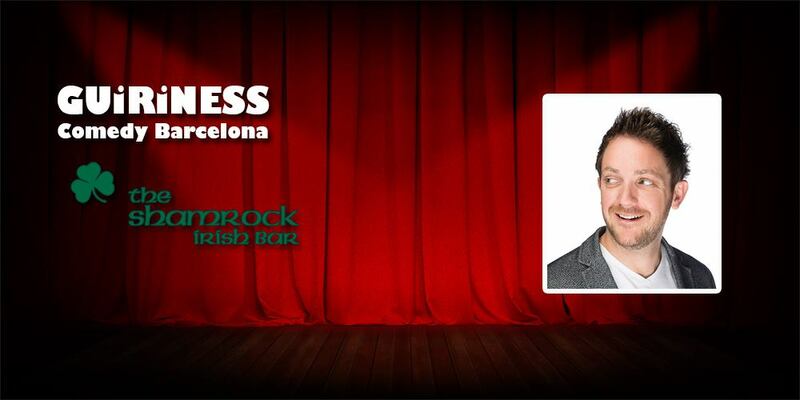 This is the only regular comedy show in Barcelona with quality comedy only and a straight hour set from a pro comedian. There are no open-mic or amateur slots prior to the set. The comedian goes on at 21.30h! Previous post World Cup Football 2018 at Shamrock! Next post Pedro’s Birthday Party!